You'll be introduced to your choice of airconditioned two and three bedroom apartments with generous bedrooms, complete kitchen facilities including dishwasher, filtered water. Some have spa's while each have family size "alfresco" patios and balconies. All this just a level 900m stroll to the dining and shopping precincts, 200 m to the golden sands of main beach and the shore of the lake. All but one has been delightfully refurbished in a casual beach style suits couples or family of 4. Some have spas, while all offer a family size alfresco balcony off the spacious living area just 200m level stroll to the beach or lake and 900m to the centre of town. Generous proportions with full facilities and second toilet and powder room off main bedroom. Fax, email and internet during business hours. Maximum of four in a two bedroom, maximum of six in a three bedroom. Garage parking for most and off street parking for all in those busy periods. MIdway between Melbourne and Sydney with Australias capital just a 2.5 hour drive. Merimbula is the middle of everywhere. 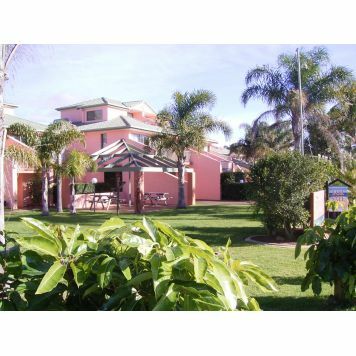 Tuscany is located 200m from Main Beach Merimbula, 200m from Merimbula Lake - fishing & boat hire and we are a short flat walk away from Town Centre shops, cafes & clubs. Merimbula offers many natural attractions as well as man-made activities. The area is surrounded by magnificant national parks along the coastline and inland. Apart from the fishing and boating activities available to ocean and lake vessels, there are 5 excellent golf courses within 20 minutes drive, bowling clubs, tennis, whale watching, diving, surfing, horse-riding etc. Merimbula plays host to a number of golfing, bowling and tennis tournaments each year, as well as an annual Jazz Festival, Country Music Festival, Mambo weekend, and of course Eden's Whale Festival. Merimbula is situated only 20 minutes drive from Eden to the south, and Bega and Tathra to the north.